This is one of the most intact early stores in the Central Area. It was owned for more than fifty years by the Ziebarth family, and operated as the Yesler Hardware and Plumbing Supply Store. This elegant brick building, constructed in 1912, reflects the importance of the Yesler business district, which was on the city's first major street car line and surrounded by many of the earliest homes outside of downtown. 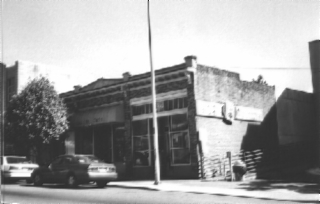 The store is at the top of the hill, adjacent to Congregation Bikur Cholim (now Langston Hughes Cultural Center), a large synagogue constructed in 1912-15, about the same time as the store. The Ziebarths may have been members of this congregation. The Central Area had a significant Jewish community until after World War II, when many moved to the suburbs. Their synagogues and other structures remain, primarily used as civic structures like this one, or by other religious groups. This one-story brick building has a gabled parapet above the main entry, a modillion cornice with four large decorative brackets and belt courses above and below the transoms. Pilasters with metal caps pierce the cornice. The three storefronts have recessed entries and intact transoms; two have newer sash and doors. An old metal sign remains on the west elevation, saying "Yesler Hardware and Plumbing Co."